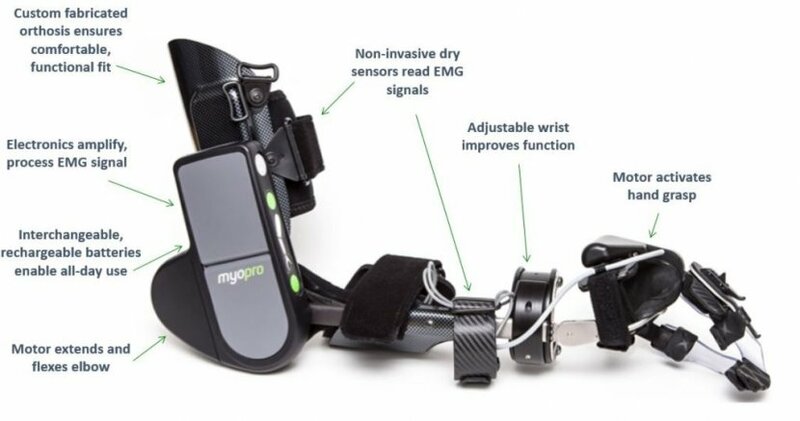 The MyoPro is an EMG triggered robotic upper limb orthosis. It provides active assistance for bending and straightening the elbow and opening and closing the fingers. It is intended to be a 'neuro prosthesis' meaning that after developing proficiency the Myopro user is able to complete functional tasks while wearing the orthosis that they could not do without it. It is therefore available for purchase as a bespoke item for home use. The MyoPro detects the user's own EMG signals (even very weak ones) magnifies them and uses them to drive motors on board to move the elbow and hand. This control strategy has been used for decades in the prosthetic industry. New MyoPro users attend therapy in order to maximise both the functional and the therapeutic benefits. Through a multi-phase therapy programme, MyoPro users engage in repetitive task practice, task specific and funtional training. Advanced users learn how to use the MyoPro to perform meaningful activities of daily living and even work/school related tasks. Common indications include Brachial Plexopathies, stroke, brain injury, spinal cord injury. In collaboration with the US MyoMo team, Hobbs is developing services to support purchasers and rehabilitation users. Typically, purchasers would need 2 to 3 months of training with a MyoPro therapist, 5 times per week to enable functional use of the device in daily life. We will provide this service to outpatients. Rehabilitation use of the device is available on an outpatient basis with individualised treatment being supplied as clinically appropriate. Please contact Joe Green via technologylead@hobbsrehabilitation.co.uk to discuss your individual requirements.